Cabo Pino Beach, with a length of 1,200 meters, with golden sand and moderate waves, is in a protected dune area known as the Artola dunes. It is a rustic beach, with an average occupancy level, and has one of the most beautiful marinas in the province, the Port of Cape Pino. The state of water is optimal in the area. Next to this nice environment we find the URBANIZACIÓN CABO PINO, idyllic place for a holiday, long term stays and even take up residence. 800 meters has Nagüelles Beach. The occupation is mean and blond sand has been reclaimed. It is located in the so-called Golden Mile Marbella, next to the Nagüelles complex, and various well-known hotels in the area. On this beach nautical sports activities, such as windsurfing, jet skis, ... are practiced. Beach of the Monteros is located in a semi-urban area, next to idyllic developments as RIO REAL. It has a length of 2,000 meters and golden sand dunes typical of the enclave. The state of the water is optimum, obtaining during the years 1992-1996 the Blue Flag award. Close to this beach is the legendary URBANIZACIÓN PALM BEACH, shelter famous of all nationalities in the Costa del Sol. 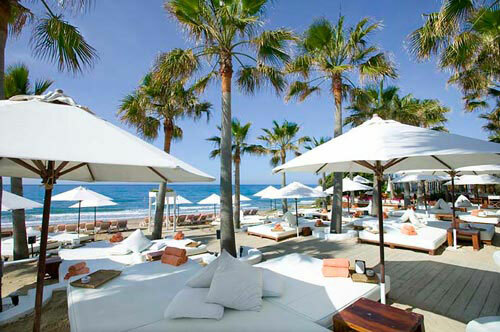 In the town of Nueva Andalucía, the Playa de Puerto Banus, to the east of the port of the same name. A length of 1,000 meters and its fine white sand, common in the Mediterranean region. It has great facilities and is suitable for water sports of all kinds. It is very close to Puerto Banus and URBANIZACIONES NEW ANDALUSIA. Beach of the Chapas has an area of 1,000 meters and the fine golden sand. Its occupancy rate is medium and is nestled next to Las Chapas. It has all the services and facilities, as well as municipal surveillance during the summer. Beach of the Canas, with a low degree of occupation, is in the east of Marbella, along with other renowned, such as Playa La Vibora or Real Zaragoza. It highlights its composition of fine sand and stones. In the vicinity is the town of Elviria and its great developments such as the MONTELVIRIA. This beach, 1,200 meters long, has all the services and infrastructure of these beaches Malaga coast. 4.8 of 5 based on 1343 votes.